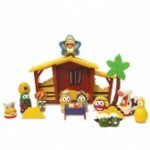 Children’s Nativity Sets up to 40% off: Veggie Tales and Peanuts! 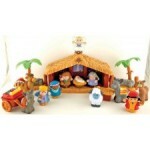 You are here: Home / online shopping / Children’s Nativity Sets up to 40% off: Veggie Tales and Peanuts! If you missed out on the deal on the Fisher Price Little People Nativity that I posted about earlier, unfortunately the coupon codes are no longer working. 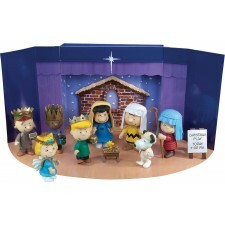 You can still score the Peanuts Christmas Pageant Nativity Play Set for $23.09 or the Veggie Tales Nativity plus DVD for $24.99. When my kids were younger, we got the Little People Nativity set, and they love having their own nativity to play with every year. This is a great way to remind your kids about the true meaning of Christmas! Go to your shopping cart and use the code 128631373 (I just tried it) to get 30% off, which makes this just $23.09. Shipping is just $3.09 or free when you spend $35 or more. If your kids love Veggie Tales, you won’t want to miss out on this deal! 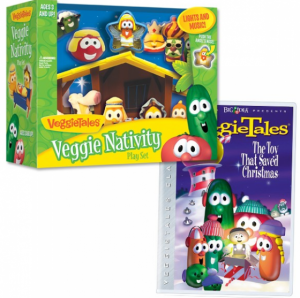 Get the Veggie Tales Nativity Set and The Toy That Saved Christmas DVD for just $24.99! It’s regularly $39.98! You get free shipping when you spend $30 or more, so you might want to consider adding one of this Super Sale titles for just $6.97 each to bring your total to $30. The movies would make great stocking stuffers! Veggie Tales Nativity set + DVD for $18.74! 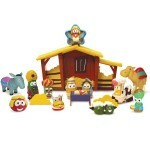 Veggie Tales Nativity on sale for $17.99! Veggie Tales Nativity as low as $9.99 + 40% off the entire site! 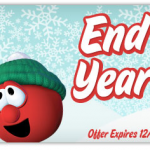 Veggie Tales End of Year Sale: up to 40% off on CDs, DVDs, and more!